Start reading The Last Hours of Ancient Sunlight on your Kindle in under a minute. While everything appears to be collapsing around us -- ecodamage, genetic engineering, virulent diseases, the end of cheap oil, water shortages, global famine, wars -- we can still do something about it and create a world that will work for us and for our childrens children. The inspiration for Leonardo DiCaprios web movie Global Warning, The Last Hours of Ancient Sunlight details what is happening to our planet, the reasons for our cultures blind behavior, and how we can fix the problem. Thom Hartmanns comprehensive book, originally published in 1998, has become one of the fundamental handbooks of the environmental activist movement. Now, with fresh, updated material and a focus on political activism and its effect on corporate behavior, The Last Hours of Ancient Sunlight helps us understand--and heal--our relationship to the world, to each other, and to our natural resources. Sun is stored as oil. Ancient water wells. Sun is stored in trees. These old resources are running out at an incredible rate around the world and we need water and energy in our future so unlike ancient civilizations that crashed partly due to resource exhaustion we may want to think more about this now. Combined with 'diet for a new ameria' john robbins you can see that cows and pigs take a huge chunk of the food, water, and energy that we could better use for ourselves and make those old sources of energy stretch further and we'd be healthier for it (earth along with us). Thom Hartman make an impressive and extraordinary approach to discover and implement sustainable solutions for our exploited and depleted Earth. A hope for future generations. Here is a clear solution for what underlies most if not all of the major challenges in our modern time. 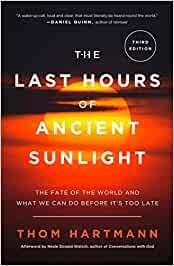 Thom Hartmann's "The Last Hours of Ancient Sunlight" is extremely important and cogent, and needs to be read and absorbed by many to ensure the possibility of a future for the human race and all other life on Earth. Divided into three main parts, this book explains in detail where we are, how and why we got here, and what we can do for a brighter future. Very practical, well-researched, comprehensive. I am not aware of a better book on the issues, especially since it not only sets out the realities of our situation (dependence on dwindling oil and clean-water supplies, destruction of forests and plant/animal species, unsustainable population growth, frequent wars, third-world and first-world impoverishment, etc. ), but also explains why, fundamentally, human civilization has gotten us into this mess (tracing the causes back thousands of years to the basis of civilization and comparing the recent city-state or nation-state lifestyle to that of the much older tribe), and what we can possibly do to change our course and save our children and their children and the planet they will inherit. I would give a more detailed or articulate description, but I lent my copy out the day I finished reading it, and several people are already waiting in line to borrow it. If there is a book to buy multiple copies of and give away, this is the best one I have found. Do not let it sit on the bookshelf indefinitely - after you read it, pass it around, from one person to another, making sure it never stays the same place, unread, for long. If you must keep a copy for your own reference, at least buy a second one to pass around to your friends. 5.0 out of 5 starsA MUST READ FOR EVERYONE! All of Thom's predictions of our present time involving corporatism to political movements to warnings of the coming days of food and clean water shortages can be found in this book! THIS BOOK IS A MUST READ FOR EVERYONE, WHETHER YOU ARE ACTIVELY POLITICAL OR NOT!